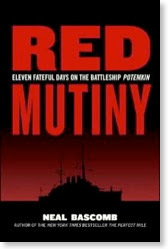 One book leads to another and reading this book was the direct result of reading Boris Gindins “Mutiny- the Real Life Events that inspired the Hunt for Red October”. This book marks the first time that the subject of the 1905 mutiny aboard Potemkin has been written about utilizing the manuscripts of the various participants of the mutiny as well as declassified Russian Naval records. As a result of this plethora of information we now have the only full account of the events as they unfolded in the Black Sea over 100 years ago. Beginning with the moldy bread and maggot infested meat, this book takes off like a shot and keeps on coming! The crew is divided at first- and the First Officer has his hands full trying to keep the crew together as Tsar Nicholas II begins the hunt to capture or destroy the Potemkin. The ship anchors at Odessa where they hope to inspire a Revolution ashore and then take the entire fleet. The Russian fleet tracks and pursues the Potemkin but twice the ship slips away. The unwillingness of the crews on the pursuing vessels to fire on their own comrades thwarts the Russian Tsar in his efforts to regain his prized warship and results in a mutiny on a second ship as well. At the same time- the unwillingness of the Potemkin crew to shell the city of Odessa as threatened, reduces the mutiny to a cat and mouse chase across the Black Sea to Romania, where ultimately the crew slips ashore and the Potemkin is returned to the Tsar. Mr. Bascomb has taken a myriad of information and distilled it into a compelling read.